The biblical book of Revelation, also called the Apocalypse, is a mystical vision of the end of the world, supposed to have been written by St. John the Evangelist. Inspired in large part by the prophetic writings of a Cistercian abbot who died in 1202, much of Europe believed that the end of the world would occur during the 13th century. One of the most widely anticipated dates was the year 1260 (subsequently amended to 1284, and then to 1290); it is therefore no coincidence that many Apocalypse manuscripts date from the 1250s and 1260s. This copy was probably made in London or Westminster, but was in Beccles (Suffolk) by the 19th century, and may have been in East Anglia from the Middle Ages. In the apocryphal 'Acts of John' is a miracle in which St. John revives the dead son of a widow. 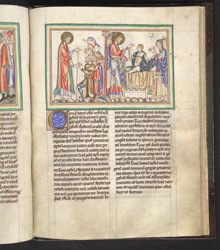 The artist has depicted the events in two parts: to the left the widow and others implore John for his help; on the right he raises the dead youth from his bier.